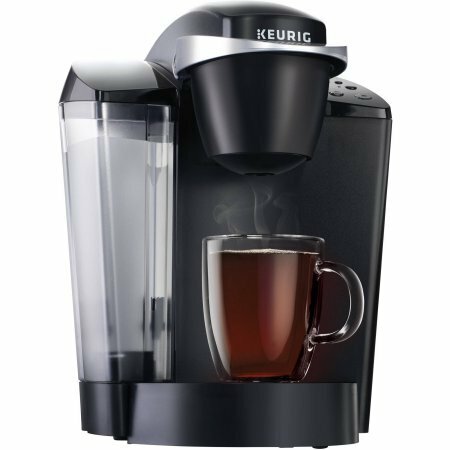 All the Keurig K50 does is brew drinks: coffee, tea, hot chocolate. It accepts K-pods from more than 70 different roasters, offering more than 500 flavors of hot drinks. Your favorite brand has a new medium roast you want to try with breakfast? Pop it in. You want to spend the afternoon relaxing over a book with a chai? Put in that K-pod. In less than a minute, you’ve got yourself a hot cup of something soothing. However, that is literally all that it does. The K50 is a classic Keurig design, which means it was made without a lot of extra features to maximize its capabilities. Some of the push-button features from later models are missing. It’s also a bit more expensive than newer Keurigs with more features. Brew sizes: 6, 8, 10 oz. Water capacity: Removable 48 oz. K-cup versatility means you can brew a massive range of different coffees. All the different roasts and flavors that can be packed into a K-cup are available to you. That doesn’t just include coffee. That means different kinds of tea and hot chocolate. Iced drinks only require dropping a couple of cubes into your cup. That means a nearly inexhaustible variety is available. Go to a coffee shop and order a specialty chai latte, and you might spend quite a long time waiting to hear the barista call your name. Or you could press a button on your Keurig K50 and get the same drink in less than a minute, without worrying that a moment’s distraction might cause you to miss that your order is ready. The Keurig advantage is that most of the hard work went into the making of the K-cup, which leaves you just the press of a button away from coffee, tea, or hot chocolate. You sit down in your comfy chair with a book and a morning cup of coffee, and as soon as you’ve settled in you realize that you didn’t turn off your K50. Worry not. After 30 seconds of non-activity, the K50 will turn itself off. This means the most difficult brainwork for you is picking which K-cup to use. The coffee maker will take care of itself. Does this machine make iced coffee? Yes, if making iced coffee means it brews regular hot coffee and the user adds ice to it or brews it directly over ice. Is it compatible with K-mug and K-carafe pods? Does it come with a timer? You’re thinking, this is all great, but just what does the world’s most impartial, deliberative jury, the Internet, think of the K50? You can spend hours reading online reviews. The model is old enough and distributed widely enough that there is no end of opinions about it available online. Do you really want to read all of them? Unless you are 75 percent masochist, absolutely not. We are, and did, and condensed the general consensus down for you to easily digest here. Despite its age, the K50 remains pretty popular for basic reasons. People might say they want a lot of flashy lights and features, but most people buy a Keurig because they want to brew high-end coffee quickly. They buy it for that and not the associated gadgets. In fact, users praised the K50 for its ease of use. The fact that operating it doesn’t require a lot of brainpower was appealing to a wide swath of people who bought it. It was also popular because it permits people to make coffee as they want it, not make a whole pot to let the dregs get old and stale. These same folks liked the removable 48-ounce water reservoir because it meant going longer before having to add more water. Users who didn’t like it mostly cited reliability issues. It made coffee right up until it no longer made coffee, or it clogged up. Oddly enough, the lack of features wasn’t really an issue in how people rated the K50. The bottom line that it was judged on was how easily and efficiently it made coffee and whether it remained reliable after continued use. The K50 is popular as a no-frills coffee maker that does the work and allows its users to settle in and just enjoy their preferred beverage. Keurig’s K50 just brews coffee and brews it quickly. That’s both the good and bad of it. It is compatible with the K-cups from more than 70 of the world’s leading roasters and offers access to more than 500 flavors. That’s an impressive variety. You can extend that by adding ice for cool summer drinks. It also brews in less than a minute. It allows users to customize the strength of brewing by choosing from 6, 8, or 10 ounces. But, again, brewing drinks is all the K50 does. It’s an older Keurig model that doesn’t come with any of the added features that the company made available for newer, more up-to-date models. It’s not as easy to keep it clean, and the only thing it has that approaches programmability is that it’ll turn itself off after 30 seconds of non-activity. Plus, it’s a little more expensive than newer models with more features.